How Do I Choose the Best Steam Curling Iron? Anyone planning to use a curling iron near the scalp should choose a non-steam iron. 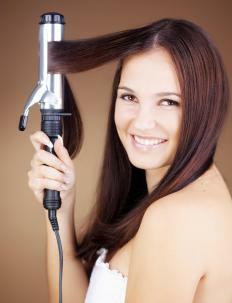 A steam curling iron curls your hair with the heated barrel and sets the curl with jets of steam. You may wish to select a curling iron that has tourmaline or ceramic elements to help eliminate static and frizz. These models usually cost more than basic models, but can help protect your hair from the heat. To choose the best steam curling iron you should consider what kind of hairstyle you want. This will help you select the right barrel size and will help you determine whether you need more than one curling iron. Steam hair styling works in much the same way as steam ironing — as the moisture from the steam quickly evaporates because of the heat, the dried curl becomes set. You must be careful not to burn yourself when using a steam curling iron. This can happen if you hold the iron too close to your scalp or if it touches other skin. If you plan to curl the hair that is right against your scalp, you should probably opt for a non-steam iron or use curlers instead. One of the most important considerations when choosing a steam curling iron is the size of the barrel. The barrel is the long end that hair is wrapped around and clipped against to create the curl. A small barrel will leave a tiny, tight curl. Barrels with a large circumference create a looser curl, and are great for wavy, casual styles. Many people have more than one steam curling iron to use for different styles or on different parts of their hair. There are many other types of curling irons available in addition to the standard single-barrel type, and most come with or without steam. A three-barrel iron has three barrels set equally across its width. The hair is not wound around the barrels with these irons, but is slightly crimped by the heated barrels to create a uniform wave. Curling irons that are shaped like cones can also be used to create a specific type of spiral curl. A high-quality steam curling iron of any style model should have adjustable temperature controls. If you have long, thick hair, an iron that can provide higher heat may work best. Thin hair could be damaged with an iron that is too hot, so one that will adjust down may be ideal. Ceramic can typically get hotter while still protecting your hair, and may be ideal for hard to style hair. There are two other things to consider when choosing a steam curling iron. You may want a version that has accessories, such as snap-on combs in different designs, for instance. You should also make sure the cord is long enough so that you can use the iron comfortably. How Do I Choose the Best Curling Iron for Thick Hair? How Do I Choose the Best Steamer Set? How Do I Choose the Best Double Barrel Curling Iron? How Do I Choose the Right Curling Iron Size? Steam curling irons have singed my ears a time or two, so I'm very leery of them. I've had beauticians use them on my hair and they hit that steam button and got my ears, and in one case, my forehead. It wasn't pleasant. You have to be really careful when you're using those steam curling irons. It's real steam, and it's hot, so caution is a must, if you don't want to end up with steam burns in conspicuous places. I think I'll stick to the regular curling irons and just put extra styling mousse in my hair to hold the curls. I'd also say make sure it's easy to add water to the iron, even if it's hot. Some curling irons have a tip you unscrew and you fill the barrel with water, and then put the barrel back in. Those are probably the easiest. I've seen some where you pour water into a reservoir and snap on a cap, but those are kind of messy, I think. I'd rather have the kind where you fill the barrel. Being able to apply the steam easily is also good. I've seen some where you press the tip in and get steam, and some that have steam buttons on the handle. It all depends on personal preference.